Trusted by generations for an unbeatable streak-free shine,* Windex® Original is our best solution for lightening and brightening your home. 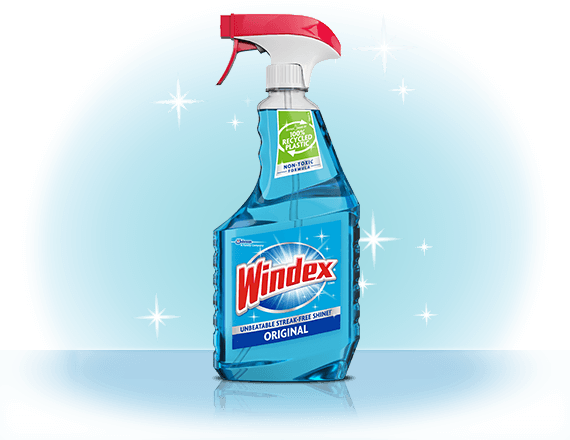 Windex® Original Glass Cleaner starts working on dirt, grime, fingerprints and other messes even before you wipe. Not satisfied with your sparkle? Claim your money-back guarantee. Finally, make sure there is not a film left on the surface from a previous cleaner. For car windows, we recommend using Windex® Ammonia-Free Glass Cleaner. You can use Windex® Ammonia-Free Glass Cleaner on your vehicle’s tinted windows, mirrors, glass, chrome, stainless steel, plastic, and vinyl surfaces. For a streak-free shine, clean car windows when the surface is cool and out of direct sunlight whenever possible. For best results, use a Windex® Multi-Surface Cleaner on countertops made from marble, granite, ceramic tile, enameled paint (appliances), stainless steel, and chrome.